Some days (well, maybe most days) I dislike the month of April in the Maritimes. There is more light and the birds are singing, but the weather – don’t get me started. Then there are days like today, when my cat and I can hang out on the deck in the sunshine, there is laundry on the line and I’m typing away outdoors. On those days where I swear never to leave the house until it is really spring, I think about what do I need right now? I need to feel a sense of lightness in my body and in my mind. This sense of lightness feels to me like play, or playfulness. What brings you a sense of play? of lightness? Is it dancing, or music, or reading? Lately I’ve been enjoying learning to spin. 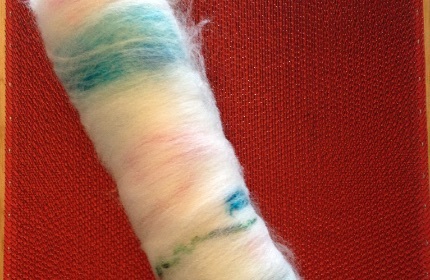 I especially love blending fibres to spin. 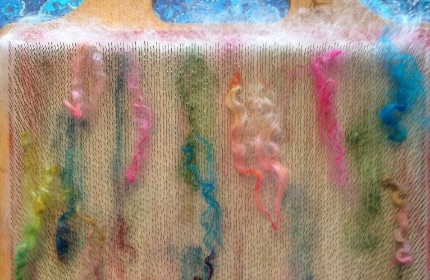 I get to play with colours and different fibres (wool, angora, silk) and arrange them on my blending board. Then I roll them up (called a rolag) and it’s ready to spin. The result is usually a nice surprise, as I don’t know how the fibres will emerge. Mostly I enjoy the process of selecting the fibres and placing them on the blending board. On those not so wonderful April days I alternate writing proposals, preparing for upcoming talks and workshops with breaks to blend fibres. How are you inviting a sense of play into your life and work? If you are interested in reading more about cultivating a sense of play, you will want to take a look at my previous blog post Playing Full On . This is a rolag from my blending board. Now I’m ready to spin!